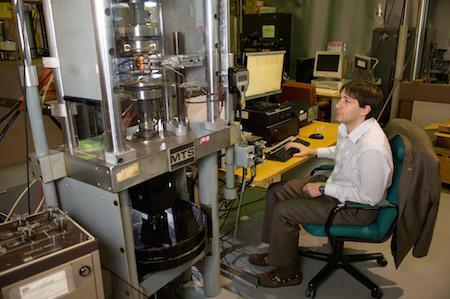 For the past two years, the former Mechanical Properties Research Laboratory (MPRL) has been transitioning into a user facility administered through the Institute for Materials (IMat). This new user facility, now called the Mechanical Properties Characterization Facility (MPCF), features equipment rentals, staff time for training, and materials & supplies charged through SUMS. Details including costs to use the facilities can be found on our website, mpcf.gatech.edu. MPCF has a full-time Research Engineer, Dr. James Collins, who provides training on the use of a variety of mechanical test systems, and helps coordinate the usage. MPCF staff can provide support in setting up test programs, designing accessories and adapters, developing new protocols, integrating new sensors and transducers, developing control algorithms, etc. A wide range of materials can be and have been tested in MPCF including all sorts of metal alloys, polymers, ceramics, and different types of composites, as well as testing of components. MPCF staff also perform routine maintenance and repairs to keep systems in a state of readiness to ensure users of the facility obtain good data in a minimal amount of time. The MPCF presently occupies a total of 4250 sq. ft. across three buildings [2500 sq. ft. in Bunger-Henry (rooms 153, 158, and 173), 1250 sq. ft. in Callaway (MaRC) Hi-bay lab and 500 sq. ft. in MRDC 2340]. Gripping / adapters for tension, compression, bending, fracture, etc. Various extensometers for axial, diametral, axial-torsion, high temperature, crack opening, etc. In addition, MPCF supports a wet lab with specific expertise on metallography and failure analysis to prepare samples for either mechanical property testing or for further analysis using tools in the Materials Characterization Facility (MCF) also administered through the Institute for Materials (IMat). For more information, visit mpcf.gatech.edu. Capability questions may be forwarded to Dr. Collins at james.collins@me.gatech.edu, or if you may submit a test proposal at mpcf.gatech.edu.